Alles begann 1996, als sich ein paar Amsterdamer Jungs mit jüdischem Hintergrund für die eingängigen Melodien der Klezmer-Musik und des Balkan begeisterten und auf der Straße und vor Clubs aufspielten. Seither hat sich die Band in ein siebenköpfiges Ensemble entwickelt, das zu den besten seiner Art in Europa zählt. Jetzt haben wir 2011 und die AMSTERDAM KLEZMER BAND spielt vor enthusiastischem Publikum, sei es in den Niederlanden, ganz Europa oder gar Brasilien. Ihr erfrischender Ansatz von Klezmer und Balkan-Sounds überwindet die traditionellen Aspekte jener Stile und bringt so einen sehr lebhaften Mix an osteuropäischer Musik hervor. Ihre Stärke ist die Fähigkeit, eine bemerkenswert breit gefächerte Zuhörerschaft jeden Alters in ihren Bann zu ziehen; sie spielen in Clubs oder Theatern, auf Festivals, Partys, Hochzeiten oder bei formellen Anlässen. AMSTERDAM KLEZMER BAND kann eine Menschenmenge dazu bringen, wild zu tanzen oder den Leuten pures Hörvergnügen bereiten. Beliebte Stücke der AMSTERDAM KLEZMER BAND werden gerne gecovert, ihre Remixe fanden ihren Weg in die Clubs von Berlin nach Sydney. In den letzten Jahren sind sie überall auf der Welt aufgetreten. 15 Jahre auf Tour haben die Band in ein höchst produktives Kollektiv zusammengeschweißt. Zwei Statements mögen ihren undogmatischen Ansatz unterstreichen: "Die AMSTERDAM KLEZMER BAND wurde nicht für 'Klezmer-Puristen' geschaffen, schon alleine, weil Klezmer nie als Musik angelegt war, die poliert und perfektioniert in Konzerthallen aufgeführt werden sollte. Mit ihrer rauen wie fröhlichen Herangehensweise hat die Band die Klezmer-Musik aus den Konservatorien wieder auf die Straße zurückgeholt. ", bringt es die große niederländische Tageszeitung NRC auf den Punkt. "AMSTERDAM KLEZMER BAND sind meine Lieblingsband. Sie wissen genau, wie es ist, in Bars zu spielen. Sie klingen so wie eine Klezmerversion der Pogues. Sie geben dem Klezmer seine ‚street credibility' zurück. ", so der französische Comic-Star Joann Sfar, der die Band einlud, den Soundtrack für seinen Film "Die Katze des Rabbiners" einzuspielen. Jetzt wurde der unverwechselbare Sound der AMSTERDAM KLEZMER BAND in vierzehn neuen, von der Band selbst geschriebenen Stücken eingefangen. Ihr neuntes Album nennt sich "KATLA". Sirba, Turbo Polka, hüftschwingender Cocek, Oompah und ungerade Metren, dargebracht in der der Band eigenen Virtuosität, formen den charakteristischen, nicht zu kopierenden Sound. Klar, dass es kein AMSTERDAM KLEZMER BAND Album ohne Frontmann Alec Kopyt (ein Kultsänger aus Odessa und Spezialist für Knastlieder) und Job Chajes geben kann. Sie singen und rappen sich durch diese neuen Schätze, durch ein höchst originelles wie infizierendes Repertoire. "KATLA" heißt der größte Vulkan Islands. Der Titel unterstreicht den explosiven Charakter dieses neuen Albums. Wir alle wissen, dass man mit Vulkanen nicht spielen soll. Doch keine Angst: Das Hören des Albums wird höchstens kaum kontrollierbare Ausbrüche von Freude herbei führen! 01. Papa Chajes (Job Chajes) Dedicated to my father, Simon Chajes. In this song we play a gentle rhythm that I enjoy using. In Holland we have the clog dance, and this feels to me like the Yiddish equivalent. 02. Katla (Theo van Tol) An ode to a kindred spirit of the AKB: Katla, one of the most active volcanoes in Iceland, named after an evil woman who, thanks to a pair of magical pants, could keep running without getting tired. She met her end when she slipped into a glacier crevasse while running, after which the volcano underneath the glacier came to life. Everybody is watching Katla. If she was to erupt, the concequences will be felt worldwide. 03. Naie Kashe (Job Chajes / Job Chajes & Alec Kopyt) As I started writing a song for Alec, the Ukrainian Kolomeike came to mind, as I really enjoy repetitive music. We ended up writing the lyrics together, and decided to use the idea of shortage of cash – familiar to almost everyone in the World – as a starting-point. -The spring is in the air, the birds are chirping, my kidneys are aching, I have no "dough", nor I get any sleep! How can I save money, when my pay is being cut and the price of liquor's going up? My memory's getting weaker: not only did I forget my home town, I have only a vague recollection of what happened yesterday?!!! Job: "A hundred days of coughing up, / Can't buy on credit, / Shopping at Poundstretcher, / Isn't up to much, / Work for low wages, / Or on the dole, / Whole days doing nothing, / Just watching TV"
04. Forget About the Rest (Jasper de Beer) This composition inspired by Turkish music is written in a 3-2-2 rhythm. The song starts with the horns playing rhythm section and the bass and accordion playing melody. There is a feature for Theo, who plays a beautiful "first take" accordion solo. 06. Nicolosia (Gijs Levelt) I composed this piece in memory of my uncle, the journalist and writer Joost Divendal (1955-2010). Nicolosia is the name of his book on the Venetian painter Bellini's muse, who posed for all of his Madonna paintings. 07. Oscar's Cocek (Gijs Levelt) This lively dance tune is dedicated to my son Oscar who was born in 2009. The song resembles his endless cheerful energy. 08. Kaas (Joop van der Linden) My feelings as a professional musician have been described quite accurately in Willem Elsschot's novel "Kaas". We struggle, but do we sell? At least, we can dance! 09. Marusja (Theo van Tol / Alec Kopyt) This is a typical cocek rhythm as played by the gypsies in Macedonia. The melody reminds the gypsies of Bucharest. Alec is singing on the marvels of growing older. -Marusya is not sunbathing on the beach any more, and my heart's beating regularly again, My sleep has returned, and there's no more sleepwalking.... Where is my sweet home Odessa with its markets and the buzz…? I have been blindfold for a long time and suddenly there's a little twist of fate, and I am the winner once again! 10. Toi (Joop van der Linden) Pour toi, jusqu'a la fin des temps. A 9/4 rhythm I heard on an Arif Sag album, a short sidestep into a çiftetelli rhythm, and the idea of a continuous, almost non-repeating melody make this tune an exploration of the orchestral possibilities of the AKB. Toi is dedicated to my wife Janneke. 11. Geen Sores (No worries) (Jasper de Beer / Job Chajes) A high speed polka, Klezmer song. The titel "Geen Sores" is Dutch/Yiddish slang for "no problems". I actually had a lot of things on my mind before writing this song but in the same time I thought, "geen sores!" or "what the hack!" let us just enjoy life! 12. Desert Banjo (Jasper de Beer) The 6 string guitar banjo that was used for this piece is a widespread instrument in North African music. I took inspiration from North African music and made a cross over with gypsy music. 13. Valentina (Gijs Levelt / Alec Kopyt) This Macedonian/Turkish/Bulgarian influenced song forms the perfect vehicle for the Amsterdam Klezmer Band's star crooner Alec Kopyt from the Ukraine. The text deals with Alec's platonic love Valentina, who is now living in Berlin. -How many roads am I still destined to walk, how many shoes am I to wear thin just to look in the eyes of the most beautiful, gentle, sweet and cheerful Valentina? She's not to be tamed or told what to do! Women like Valya are to be treasured and loved. 14. The New Terk (Janfie van Strien) This tune built on repetitive and catchy rhythm pattern one will find occasionally in the klezmer tradition is called 'Terkishe'. AKB developed a particular booty shaking conception of this groove which is in fact closely related to the renowned Turkish Çifteteli (belly dance) rhythm. Mix a helping of Klezmer with a portion of Ska, add a liberal dash of Balkan and a pinch of Gypsy. Garnish with a tablespoon of Jazz and a pinch of Punk. Throw it all in the blender and the recipe for the Amsterdam Klezmer Band is complete. Serve immediately! Their vette (throbbing) Klezmer/Balkan style never fails to leave the audience well and truly 'klezmerised'. As the wind instruments, double-bass, accordion and percussion join battle with pulsating grooves full of raw refinement, you know you are in for a long and sweaty evening; be it in a small club in Canada or Turkey or at large festivals such as Sziget in Hungary or Lowlands in the Netherlands. According to saxophonist and band leader Job Chajes, it's all about the "age-old cross-fertilisation of Hassidic, Balkan and Turkish influences, but in a modern context". The band members have been plucked both from the street and the conservatory, and have paid their dues within a range of other styles such as Jazz, Funk and Latin. "That's why the wind section can switch so effortlessly between Jamaican Ska and Serbian Bleh music" according to Chajes. Their secret lies in the surprisingly natural mix of deep-seated tradition and contemporary avant-garde. Trumpet player Gijs Levelt: "Some purists think that we're not nearly traditional enough, and yet the early Klezmorim themselves incorporated the hits of the day into their own repertoire". It is precisely this 'omnivore' approach which allows the band to embody the true spirit of Klezmer. Klezmer is nothing more or less than 19th Century Eastern European dance music for weddings and parties, as played by travelling Jewish musicians who incorporated the musical traditions that they came across into their music. The Amsterdam Klezmer Band has been based in Mokum (Yiddish for Amsterdam), itself once the 'Jerusalem of the North', since 1996 and is now celebrating the Klezmer tradition on a Global scale. Since the fall of the Berlin Wall and the brushing aside of the Iron Curtain, Amsterdam has once again become a magnet to musicians from Eastern Europe. Singer Alec Kopyt, who came to Amsterdam from Odessa, is a good example: "If someone had told me 28 years ago back in the Ukraine that I, a 19 year old rock freak, would end up performing the traditional music of my fatherland and would actually learn to love it, I'd have laughed in their face". This was his comment in 2006 on the release of the album 'Remixed!'. Kopyt is still the front man for the new album, acting as a bridge between the two harbour cities of Odessa and Amsterdam. Now and again Chajes takes over the microphone to sing lines such as: "I was born in a town that was built on stilts and where you can eat gefilte fish". This much is clear: They may be based in Amsterdam, but together they form an international outfit that stands for much more than Klezmer alone. The new CD is a boisterous testimonial to this. In fact, they might as well have been called the Amsterdam Klezmore Gang: Thanks to them, the whole mishpocha now laughs when it used to cry. Mit ihren talentierten Musikern ist die Amsterdam Klezmer Band (AKB) ein powervoller und poetischer Live-Act, der das internationale Publikum in seinen Bann zieht. Ihr erfrischender Ansatz des Klezmer und Balkan-Sounds überwindet die traditionellen Aspekte von diesem und bringt somit einen sehr lebhaften Mix an osteuropäischer Musik hervor. Ihre Stärke ist die Fähigkeit, eine bemerkenswert breit gefächerte Zuhörerschaft jeden Alters in ihren Bann zu ziehen; sie spielen in Clubs oder Theatern, auf Festivals, Partys, Hochzeiten oder bei formellen Anlässen. AKB kann eine Menschenmenge dazu bringen, wild zu tanzen sowie - durch die Lebhaftigkeit ihrer Performance - den Leuten pures Hörvergnügen bereiten. Ihr musikalisches Können wird durch den Gesang von Alec Kopyt aus Odessa und Job Chajes (auch am Saxophon) vervollständigt. Seit ihrer Gründung 1996 durch Saxophonist Job Chajes hat sich die Band unheimlich schnell entwickelt. Schlagartig wurden sie in Amsterdam für ihre lebhaften Performances auf den Straßen, in Parks und Kneipen berühmt. Bald zog auch der Rest der Niederlande mit: Unter großem Beifall spielte die Band auf Festivals und wurde im Januar 2001 zum Noorderslagfestival eingeladen (die Medien beschrieben ihre Performance als ‚die große Überraschung des Festivals’) sowie zum Lowlands Festival im August. Zur selben Zeit tourte die Band auch durch Slowenien, die Schweiz und Italien und schloss drei erfolgreiche Türkei-Tourneen ab. Die dritte CD der Amsterdam Klezmer Band, Limonchiki, wurde auf dem New Yorker Knitting Factory-Label veröffentlicht. Im Herbst 2001 tourte die Band ausführlich durch die niederländische Clubszene, wo sie unter anderem ein mitreißendes Set im Amsterdamer Paradiso spielte. 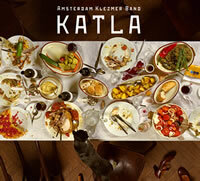 2003 erschien die CD Katakofti auf dem türkischen Label Kalan Records; sie ist das Ergebnis der Zusammenarbeit der Amsterdam Klezmer Band mit der Istanbuler Galata Gypsy Band. Im Januar 2005 wurde Son (russisch für ‘Traum’) veröffentlicht und darauf befand sich ein regelrechter Schatzfund an neuer Klezmer und Balkan-Musik. Das Album wurde von der internationalen Presse enthusiastisch angenommen und es folgte ein Jahr voller Tourneen und Gigs in Clubs und Theatern; unter anderem spielten sie im berühmten Musiktempel Concertgebouw in Amsterdam und in Venues in New York, Moskau, Paris und Hamburg. Inzwischen zählt nur noch ein Teil der Songs der Amsterdam Klezmer Band zum traditionellen Balkan- und Klezmer-Repertoire. Größtenteils wurden die AKB-Stücke von den Bandmitgliedern selbst geschrieben; diese tragen alle ohne Ausnahme musikalisch zur Erweiterung dieser Mischung aus ansteckendem Balkan/Gypsy/Klezmer bei. So arbeitet die Band daran, die musikalischen Traditionen Osteuropas, des Balkans, des Klezmer und der Gypsy-Music neu zu beleben. Leidenschaftlich gespielte Musik, spektakuläre Live-Shows und eine gute Dosis Street Credibility sind die Zutaten für ihren Cocktail: Klez dance!